When the surgeon surgically removes a melanoma, some patients are said to be 'cancer-free' and they do not get additional treatment. 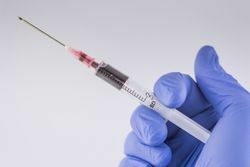 However, should the fluid obtained in the drainage implanted after surgery be tested using the liquid biopsy technique rather than be disposed of as medical waste, the test might predict the high or low risk of cancer recurrence. Patients with a high risk of late recurrence would get post-surgery treatment. This is a recent finding by scientists at the Spanish National Cancer Research Centre (CNIO), who have discovered that there are biomarkers in the fluid collected from surgically treated patients that reveal the presence of specific mutations and help determine the risk of the cancer coming back after some period of time. This is very important in melanoma, since it is an aggressive tumour type that metastasizes in a large number of patients. Researchers will now try to confirm whether the liquid biopsy technique may be even easier to perform directly on blood samples and whether it can be used in other types of tumours as well. The research work was published in the Journal of Experimental Medicine. The more scientists find about metastasis, the more they know that it is 'consciously' initiated by primary tumours, sending 'anticipatory signals' to other organs and promoting in them a suitable growth environment. These 'anticipatory signals' are primary tumour-derived extracellular vesicles that reach other organs and get them ready to host cancer cells. This is one of the main research interests of Héctor Peinado, Head of the Microenvironment and Metastasis Group at CNIO. "Our study has confirmed that, in melanoma patients, we can identify populations with higher risk of recurrence using a sensitive, accurate test of the exudative seroma," Peinado explains. The exudative seroma is a fluid that is collected from the drainage tube inserted after surgery and normally disposed of. 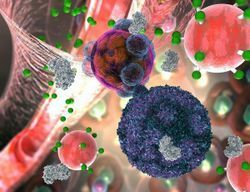 "Liquid biopsy applied to this seroma has revealed extracellular vesicles and circulating DNA with BRAF gene mutations associated with lower survival rates for melanoma patients." About 40-60% of melanoma cases involve BRAF gene mutations, most frequently the BRAFV600E mutant, studied by the researchers in this manuscript. The Head of the CNIO Microenvironment and Metastasis Group has conducted the study along with Piotr Rutkowski, researcher at the Maria Sklodowska-Curie Institute of Oncology, Poland, and José Luis Rodríguez Peralto and Pablo Ortiz, from the 12 de Octubre Hospital in Madrid. They used exudative seroma from melanoma patients to identify those with a higher risk of recurrence. 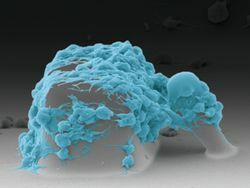 Peinado assessed the technique's potential by analysing simultaneously extracellular vesicles and circulating DNA (tumour-derived cell-free DNA that circulates in body fluids), since "our main goal was not to identify the specific fractions carrying melanoma signals but to increase test sensitivity instead." With the results of the study, hospitals might implement the technique as from today. "The method is performed in cooperation with clinical laboratories and could easily be applied in clinical practice. It only requires collecting seroma fluids and establishing the relevant protocol for collection, storage and analysis," Peinado remarks. Liquid biopsy can be used for other types of cancer too, like breast or other tumours whose treatment involves lymphadenectomy - or lymph node dissection followed by drainage. The lymph nodes removed are then evaluated for the presence of cancer. Moreover, although Peinado's study focuses on the BRAF gene, it might be adopted for other tests of gene mutations involved in the development of other tumour types. However, as the latest trends in cancer treatment show, treatments other than surgery are increasingly being used, which means that the protocol for analysing exudative seroma could be implemented less frequently in the future. Therefore, our researchers are studying the possibility of using the liquid biopsy procedure directly on blood plasma from a blood sample. "Everything seems to indicate that the possibility exists," Peinado says, "but further research is needed."